A Bat Cave Like No Other | What an Amazing World! Bli Komang took us along the main coastal road in eastern Bali where earlier that day he introduced us to what is now my favorite place on the island: Taman Ujung Sukasada. 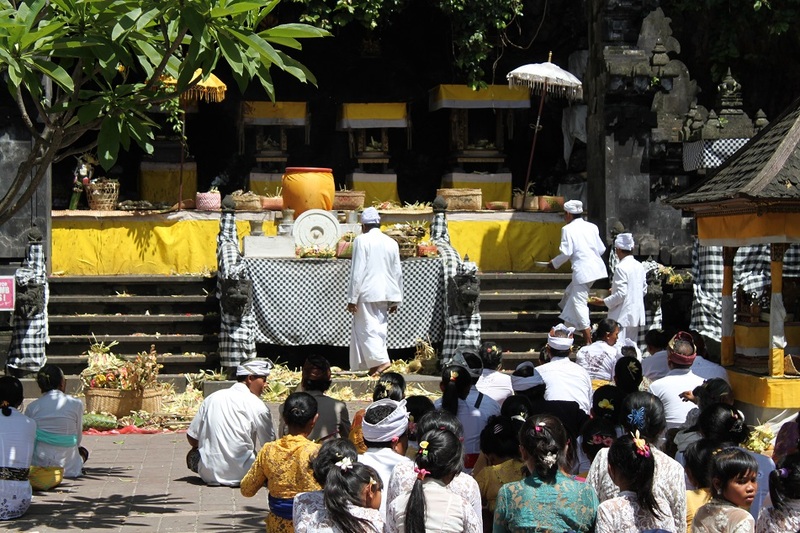 Passing by trucks loaded with high quality sand from the slopes of Mount Agung, we arrived in one of the most important puras for Balinese Hindus: Pura Goa Lawah. Under the midday sun people donning white ceremonial costumes and colorful sarungs gathered outside the temple, talking to each other at warungs, set against the coastline of the Lombok Strait. With the help of Bli Komang we put our sarungs, lent by our trusted driver himself to avoid the occasionally persistent sarung vendors often found at temples all over the island. As we stepped inside the pura’s front yard, men carrying cymbals and gongs in different sizes were sighted while others assembled at a small wantilan, signs of an impending religious ceremony later on that day. “People usually come to Goa Lawah before they hold a Ngaben ceremony for their deceased family members,” Bli Komang said to me explaining the temple’s significance in the Balinese cremation tradition. 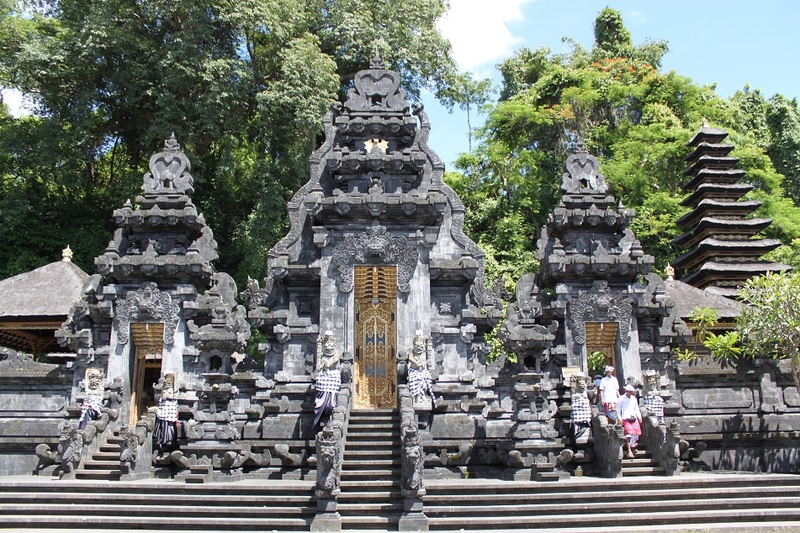 In fact, Pura Goa Lawah is one of the Sad Kahyangan, literally “six places of Gods”, a collective term to describe Bali’s holiest temples as the pillars of the island. Due to its importance, the temple’s history is heavily enveloped with legend and symbolism. Nirartha, the Majapahit priest who fled Java to Bali in the 16th century and reformed Balinese Hinduism, was the one who discovered a cave at the eastern coast of Bali which would later become one of the most sacred places on the island. Upon his arrival loud sound emanated from the cave, breaking the silence in the otherwise secluded corner of Bali. Upon further inspection he found that it was the house for a huge number of bats, blanketing the cave’s ceiling in black, hence the name Goa Lawah – Bat Cave. Bruce Wayne’s alter ego might be the first thing that conjures up in people’s minds when they think of bat cave. However this cave in Bali was purportedly the lair of a much fearsome and venerated creature: Vasuki, one of the most important nagas (dragons) in Hindu mythology. Made famous by its depiction in the story of the Churning of the Ocean of Milk – found as reliefs at Angkor Wat, statues at the entrance of Angkor Thom, also an artistic display at Bangkok’s Suvarnabhumi airport – Vasuki was believed to reside inside the cave and feed on the abundant bats that gave the cave its name. Nobody in modern time has ever attempted to explore the cave, partly due to its sacredness as well as a form of respect – and fear – of whatever creature living inside. 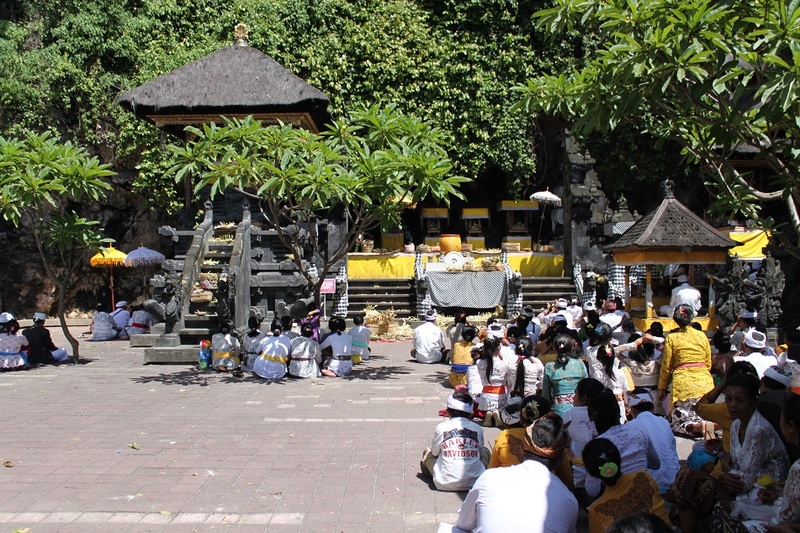 Legend has it that in the past the cave stretched all the way from Bali’s east coast to the holiest place on the island: the Mother Temple of Besakih on the slope of Mount Agung. However an earthquake in 1917 was believed to close the underground pathway, separating the two holy places forever. 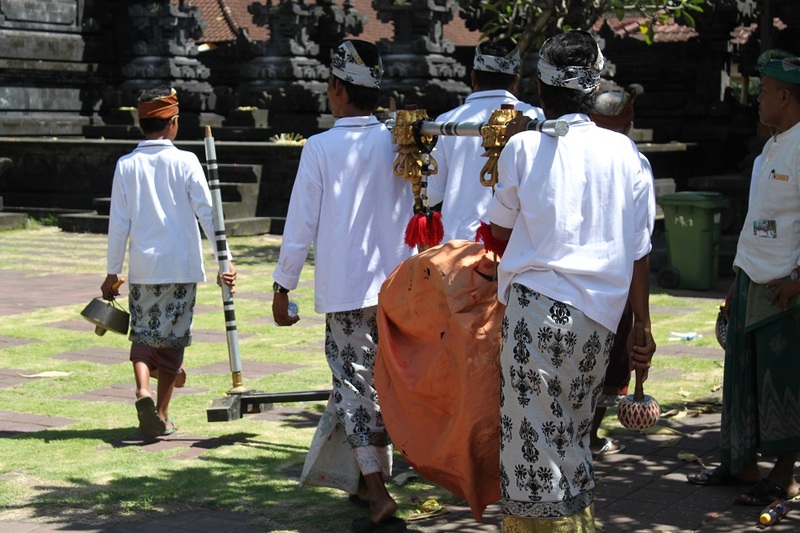 We waited for Bli Komang to signal us to enter the temple grounds as we tried not to cause any disturbance to the ceremony preparation. After the troupe with traditional musical instruments entered though the main gate, Bli Komang waved at us from afar and we followed him right away. Inside, men and women, young and old, all sat on the ground facing the cave. Hindu priests and pristesses walked around the devotees while sprinkling holy water over their heads. Once sprinkled, hands were raised and eyes were shut, prayers were made. “Look over there, you see those men with black headdresses inside the pavilion? 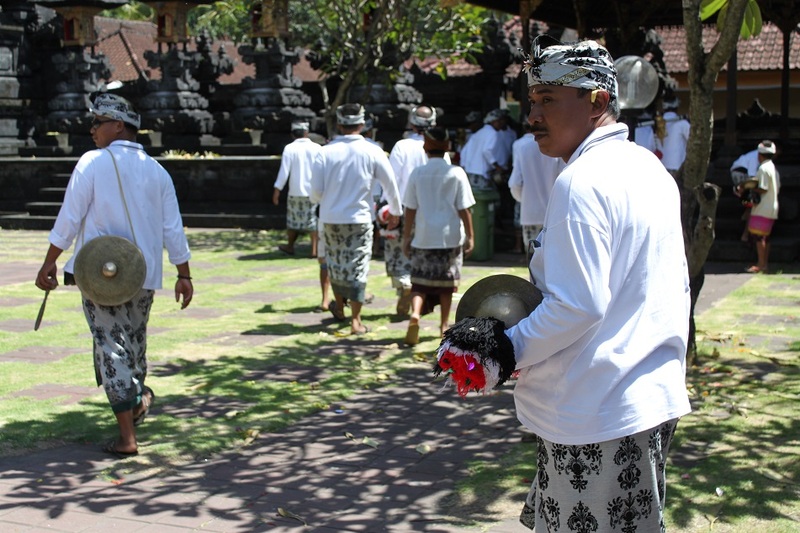 They are the high priests,” Bli Komang explained while pointing his finger to a small pavilion on our far left side. A group of older priests in more elaborate costumes overlooked everyone at the temple grounds. Before the cave, offerings were prepared at the yellow cloth-covered altars. At times priests checked on them and lit incense sticks, a gesture to please the gods and spirits. James and I stood still, witnessing one event unfolding after another from a safe distance near the entrance gate. As if he was able to read our minds, Bli Komang signaled us to move outside as more devotees congregated at the temple gounds. On our way back to the car Bli Komang suddenly stopped to chat with a young person in white robe. The two exchanged stories and smiles before parting ways. Apparently Elizabeth Gilbert was not the only one who listened to a Balinese medicine man. I love how you engaged with locals. Lovely story-telling and lovely pictures! Thanks Robin! Sometimes it’s the locals that makes a place even more interesting. Speaking of which, your captures on Morocco are something to be looked forward to. A breathtaking piece filled with glorious gems! A rich culture and heritage, thank you for sharing! And thank you for visiting and leaving such kind words, Minnie. 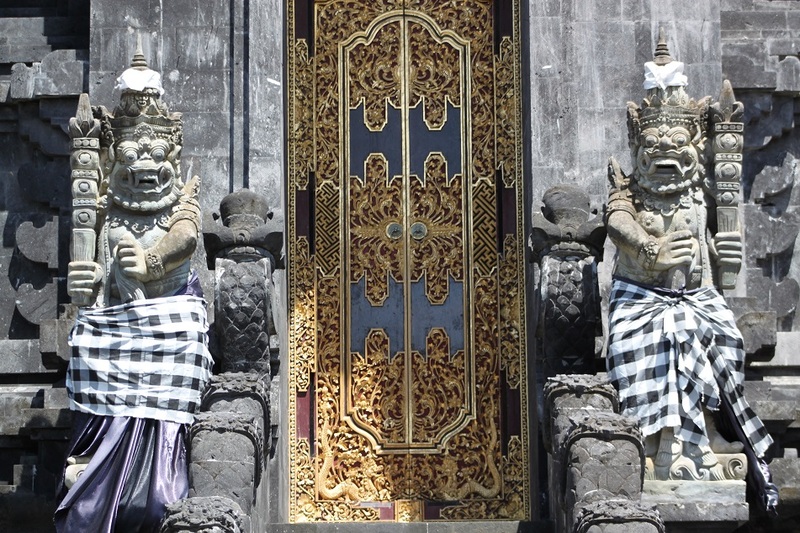 Bali’s cultural scene is arguably one of the richest in the country. Thank you so much, James. I’m glad the timing was perfect for us to go there, plus there was a priestess who together with her male counterparts prepared the ceremony in such a colorful setting. 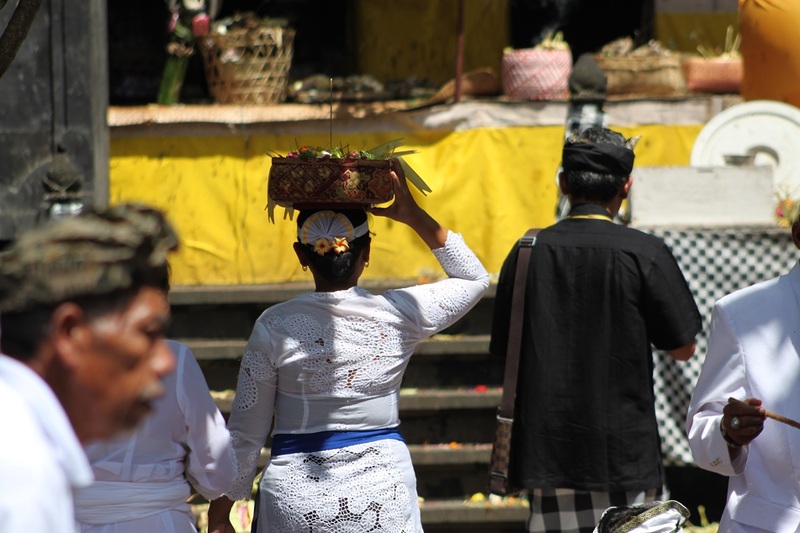 Bli Komang’s encounter with his childhood friend was totally unexpected, but it added up a new aspect to our understanding of Balinese belief system. Beautiful picture! I like it! Good week! Merci Vivien! C’est gentil. Have a nice weekend too! Thanks Lee. What a nice and fun comment you wrote! 🙂 Hopefully the next time you come to Bali you’ll have enough time to explore the temples in the eastern and northern parts of the island. Thank you for another sumptuous account Bama. Witnessing those ceremonies must have been so rewarding. Glad to see a priestess in action. it is still uncommon for women to take part in Hindu rituals in India! My pleasure, Madhu. Seeing the priestess in action was indeed one of the highlights of my visit to Pura Goa Lawah. However later on the trip I witnessed another priestess leading a ceremony before a traditional dance performance was played. 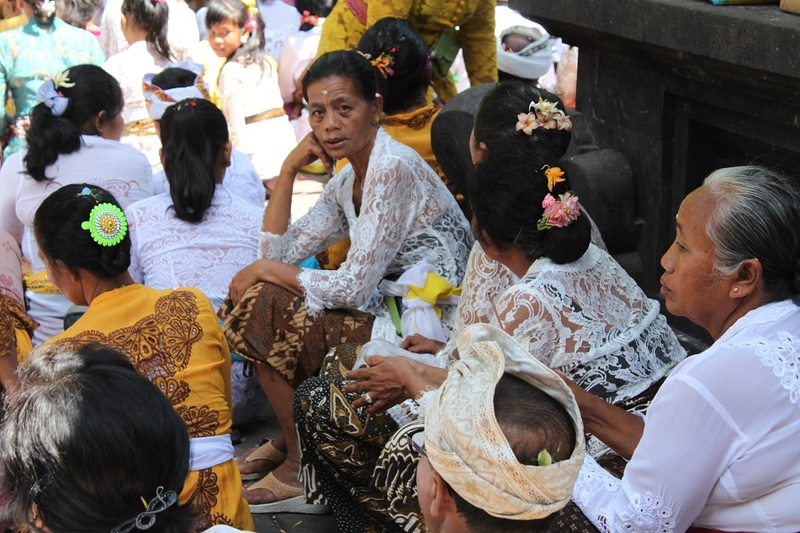 It appears that women in Bali enjoy a relatively equal position with their male counterparts. It really was. 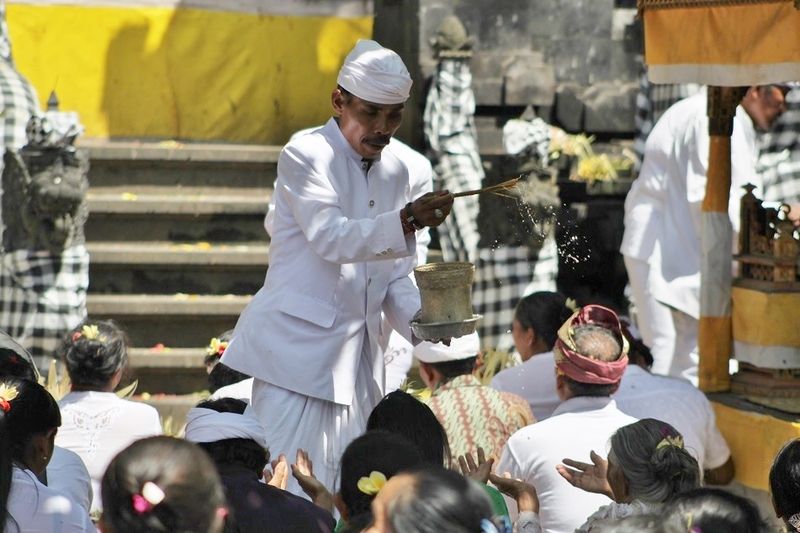 Balinese people are very proud of their traditions and that’s exactly what makes Bali such a unique island. Amazing photos, I like how you get involved. Very inspiring for someone like me who loves to travel! Thanks! Thank you. Getting to a place is one thing, getting a local perspective would leave you enriched. Happy traveling and stay safe! Lagi googling2 tentang Bali, eh nyampe di mari. Turned out this beautiful piece was written by someone familiar toh ya, haha. Hi Firzie, you’re so kind. Thanks! Anytime you need any info on Bali just let me know, I’m just a few steps away, literally.